Always having some cooked quinoa in the fridge makes for tasty and quick midweek meals, especially during the summer time. We’ve been so blessed in Ireland this year with lots of sunshine, however as I write this the air is cool, they sky is grey and its spitting rain every few minutes. Things are returning to normal but I feel most people are welcoming a day or two of cooler weather, we’re just not cut out for months of sunshine in Ireland, it knocks us off-balance hehe. 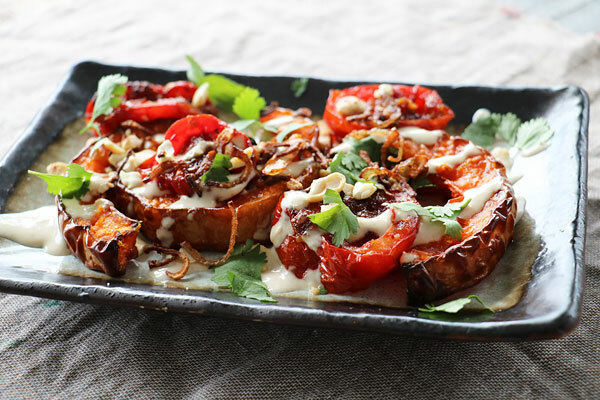 This recipe is perfect for one of those hot days, the butternut squash makes it more wholesome and gives it bite and the toasted almonds add a crunchy texture. Leaving the skin on the squash saves time and if you haven’t already tried it then you must, the skin caramelises and becomes a little chewy, it’s a delight. Preheat the oven to 200°C, place the squash in an oven dish and pour over a little oil making sure each piece is well coated. Place the tray into the oven and cook for about 30 minutes or until the squash is cooked through and it’s skin is golden brown. Always check the packet instructions for cooking the quinoa. Rinse and drain the quinoa, place in a pot with the grated garlic and cover with the stock. Cook on a gentle heat until ready. Place a non-stick pan over a medium heat and add the flaked almonds. Gently toast until lightly golden, remove from the pan and set aside and allow to cool fully. Place the quinoa in a large bowl and fluff up with a fork, add the spring onions, salt, pomegranate seeds, parsley and drizzle over the lemon juice. It’s a regular occasion when I’ll crave a bowl of spaghetti. 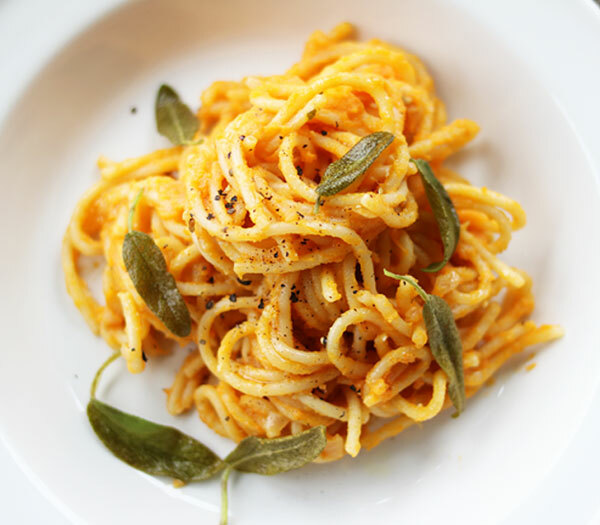 There’s something quite comforting and satisfying about this simple pasta. 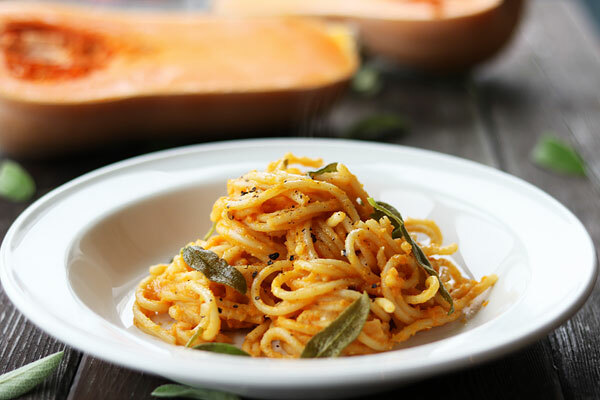 I’m happy to eat it with the most basic of tomato sauces but butternut squash is in season now and at this time of year I love to make a puree to use as a sauce for my spaghetti. You can use this same puree to make the filling for the classic dish Butternut Squash Raviolli with Butter and Sage. 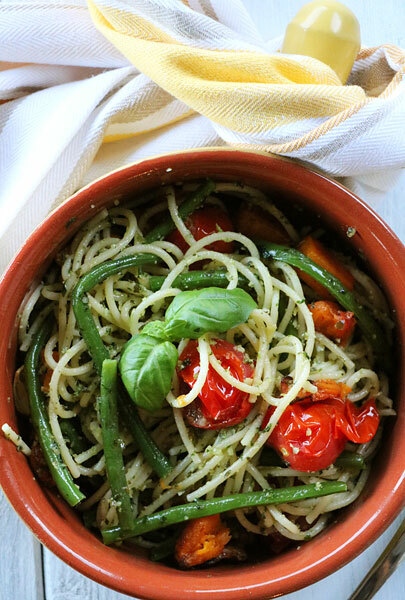 So, this week for Meatless Monday we’re having the spaghetti version of the classic. Now, you all know at this stage that I loath the prepping of the squash but I assure you that other than the peeling and chopping there isn’t really much else do this dish, it’s so simple. You can boil the squash but I prefer to roast it. This way you get those crispy, slightly burnt edges that you can nibble on before making the puree, plus the squash becomes more caramelised after roasting. In fact I’ve yet to boil this vegetable, I just don’t think you can beat the flavours from roasting it. Preheat the oven to 180°. In a large baking tray heat some oil. Then add the squash. Toss to make sure it is well coated in the oil. Cook for about 10 minutes and then add the garlic, continue to cook for a further 15 minutes.. While the squash is cooking heat some oil in a frying pan and cook the onions until soft. When the squash is cooked add it to a food processor and puree. Add some water or vegetable stock until it gets to the consistency you prefer. I like mine really thick. Bring a pot of water to the boil and add your pasta with some salt and cook according to the instructions on the packet. In a small pan heat the butter over a high heat, one by one add the sage leaves until they are starting to turn brown and become crispy. Dry off on some paper towel. Add the puree to the onion pan and stir in the parmesan and nutritional yeast. Grate in the nutmeg and keep tasting. I prefer a lot of nutmeg but again it’s all about your tastebud intuition. Season with salt and pepper. 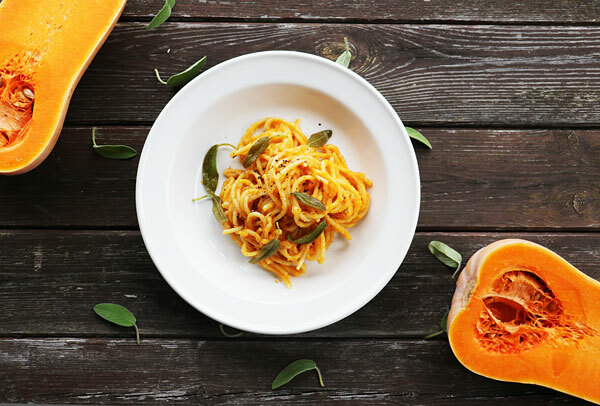 Strain the pasta and add it to the butternut sauce, mix well and serve up. Top with some crispy sage leaves. I love butternut squash, it’s such a versatile and healthy ingredient. From pasta to curries, salads and soups and even breads. It’s wholesome and gives a dish a sweet bite with substance. Although I’m a massive fan of this brightly coloured squash I’m not a fan of the prepping involved. I find the peeling of veg can sometimes be a therapeutic chore, however I never feel this way about the squash and I actually dread the prepping of it. Until now that is. In this recipe I wash the butternut squash really well and leave the skin on for roasting. This does two amazing things, firstly it saves heaps of prep time that you would need to peel the squash and secondly it creates a caramelised and chewy skin that is a real treat, like a real treat! Sweet Marie, this is the way forward for my relationship with the butternut squash. I’m also now seeing the squash in a different light. I’ve always used it as the something else in a dish, the thing that makes the filling for a ravioli or the thing that adds sweetness and bite to a curry, I’ve never considered it to be the main attraction. 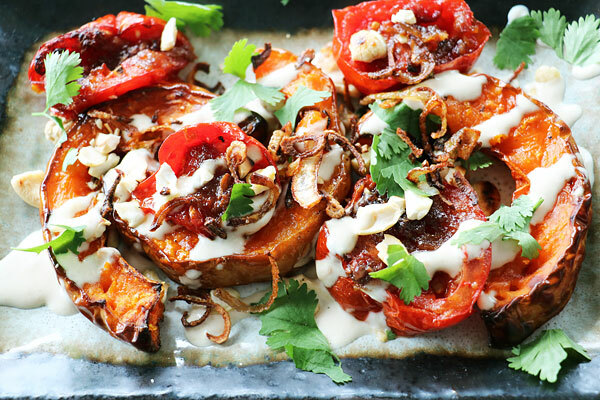 This recipe sees the butternut squash take centre stage with sweet roasted tomatoes as an accompaniment. The lime tahini dressing adds a freshness to the dish while the cashews create a depth of texture. Preheat the oven to 200°C. Cut the top off the bulb of garlic, rub a little oil on top and wrap loosely in some foil. Place the garlic on a tray in the oven and bake for 30 mins, remove and set aside. Wash and prep the squash, place it on an oven tray and drizzle on 2 tablespoons of olive oil. Make sure the squash is well coated in the oil. Place the squash in the oven and cook for 15 minutes. Reduce the oven temperature to 180°C. Cut the tomatoes in half, coat with a little oil and add them to the tray with the squash. Place the ginger, chilli, sugar and 4 to 5 cloves of the roasted garlic in a pestle and mortar along with the salt. Grind well before stirring in the remaining oil. Remove the tomatoes from the oven and coat with this dressing. Return to the oven and continue to cook for a further 10 to 15 minutes. In a food processor add all of the ingredients for the tahini dressing but only half of the water. How much water you add depends on how you like the sauce to be. I wanted a less thick consistency so I added all of the water. On a non stick pan gently toast the cashew nuts and set aside to cool. Once cooled place them inside a clean tea-towel and give them a good beating with a wooden spoon to break them up. Remove the squash and tomatoes from the oven. 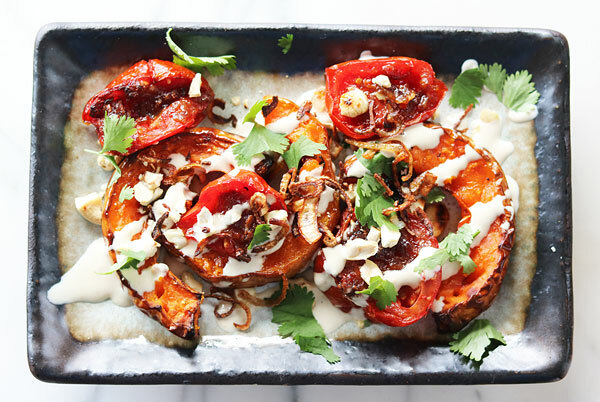 Plate up and drizzle with the tahini dressing. Sprinkle over some cashews and top the dish off with some fresh coriander leaves. It’s that time of year again when the air is crisp and smells of turf. 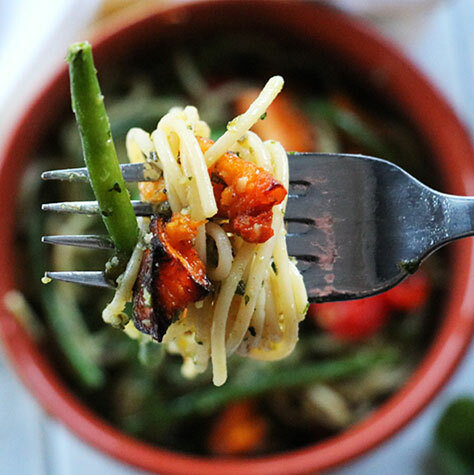 Comfort food is a favourite for me around Halloween but lately we’ve had some amazingly sunny weather in Dublin so for this week’s Meatless Monday I made a dish that includes seasonal produce yet is not too heavy. I wasn’t sure how my sister would react to this one as for her, butternut squash is something completely foreign to her palette. Thankfully she thoroughly enjoyed it and what’s more we got to eat outside before the sun set. That was pretty special! Preheat the oven to 200°C. Place the squash, garlic and oil in a large baking tray and toss well, making sure all of the ingredients have been coated in oil. Roast for about 15mins before adding the tomatoes. Continue to bake for a further 10 to 15mins or until the butternut squash has brown at the edges. Meanwhile toast the pumpkin seeds in a dry frying pan until they pop. Add to a food processor with the herbs and garlic and whizz on a low-speed. Add the vegan parmesan now if using. Slowly add the lemon juice, salt and finish with the oil. Add some salt to a pan of water and cook the pasta according to the packet instructions. Add in the beans for the last five minutes. Drain and transfer to a large pan along with the roasted veg from the oven. At this stage the squash should be brown at the edges and almost caramelised, the garlic will be soft and it should separate easily when mixed in with the pasta. Stir in the pesto and add a little water if you need to loosen the mix. Season to taste and top with some fresh basil leaves.